This is a special edition print and book produced by Peter Granser, it differs from the one available through the publishers of this book, Hatje Cantz. A journey through George W. Bush’s home country: Peter Granser photographs billboards featuring the slogans of conservative America. The arrow indicates the direction—it unmistakably points to the right: in the middle of a prairie-like, outdoor setting on a billboard with large letters that spell out “Signs.” It is an image within an image of symbolic content, for Peter Granser has given his latest series of works, which were done in Texas in 2006–07, the title Signs. After Sun City and Coney Island, Signs tracks down points of reference that can be grasped visually as a means to reveal America’s current state of mind. On his quest for suitable signs and symbols, the photographer traveled more than nineteen thousand kilometers throughout Texas, working from a stance of distant observation and skepticism as he captured images of emptiness and stagnation in George W. Bush’s home country. This book is a beautifully dirty. If you havn't seen it live, be forwarned, it fits well to a well-browsed book table at the Strand, but when you unpack it your first thought is to send it back, then you realize that, like the american system it protrays, the rough edges are simply something we have to live with. To read about Peter's work in his own words, be sure to see the interview from Jörg Colberg at Conscientious. 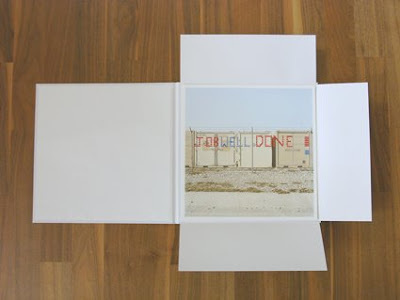 The book is harbound in a white linen, 30 x 30 cm, 132 pages, 99 color images. About the print: “Job Well Done!” was photographed in Fort Hood, Texas and shows plastic cups pressed into the holes of a fence in front of supply containers. they spell out a welcome home for soldiers returning from Iraq. 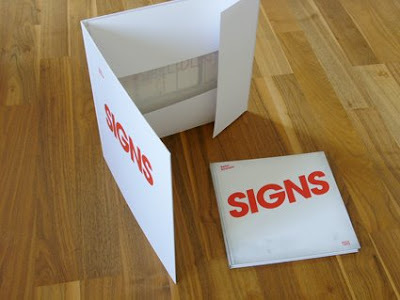 The edition is 33+3ap - the folder size is 42x42 cm, the print size 40x40cm. Archival pigment print on Hahnemühle fine art pearl paper. At the time of posting this, there were 12 left. They are available directly through Peter Granser.